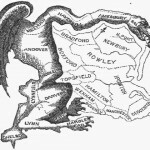 As we head into the fall election cycle, one of the most important consequences of state legislative and gubernatorial races will be the impact on redistricting in 2011. Current doctrine requires that legislative districts be equal in size and racial gerrymanders are subject to constitutional and statutory challenge. But partisan gerrymanders are almost impossible to challenge. In a case called Vieth v. Jubelirer, a four justice plurality held that allegations of a partisan gerrymander are nonjusticiable. Justice Kennedy was unwilling to say so, but conceded that he could not yet conceive of a judicially manageable standard. (Perhaps, one day, one will emerge.) While I think that Article IV, sec. 4 of the state constitution may provide a bit more room for a challenge to partisan gerrymanders of the state legislature, I wouldn’t bet the 401(k) on it. As James Troupis, a Madison lawyer and national expert on redistricting, recently told my Election Law class, partisans can work gerrymandering wonder by “cracking,” “stacking” and “packing” voters. I shared with the class this example of a gerrymander that would create seven majority Democratic districts in Wisconsin and make reelection a very difficult prospect for Congressman Paul Ryan. If one party controls both houses of the legislature and the governor’s chair, it is possible to materially affect the outcome of congressional and legislative races for the next ten years with little prospect for legal challenge. If there is split control, it is highly unlikely that the legislature and governor will produce a map. Judges wind up drawing the lines. Some states have tried to avoid the political nature of redistricting by moving to nonpartisan commissions. One interesting recent example is California. In 2008, voters narrowly passed Proposition 11 which creates a fourteen person redistricting commission. Anyone can apply. 31,ooo people did. A panel of three state auditors (with some challenges by legislative leaders) must now winnow that number to 60 based on considerations of qualifications, impartiality and diversity. Of that 60, eight people are chosen at random and they select the other six. The commission is supposed to use traditional nonpartisan districting criteria. There is, of course, no way that the plan would have been enacted by the California legislature which is strongly Democratic (and thus confident that their party would control the process) and, by definition, made up of incumbents who notoriously draw lines to protect themselves. In recent election cycles, incumbent state legislators have had about a 99% reelection rate in California. UCLA law professor and election law expert Daniel Lowenstein is heading an effort to repeal Proposition 11 with the backing of certain Democratic members of Congress. Professor Lowenstein calls it a “Rube Goldberg” system in which the machinations of interest groups will be hidden and immunized from public accountability. It does seem a rather odd construct. Of course, there are partisan undertones to Proposition 11 as is almost always the case in redistricting. It’s not surprising that Republicans would support it. It gives them an equal seat at the table that they would be very unlikely to gain as a result of state legislative races. In addition, some experts argue that Republicans tend to benefit from “neutral” redistricting principles, i.e., compactness, contiguity, respect for political boundaries, etc. This is not because Republicans are less interested in gerrymanders, but because – or so the theory goes – certain Democratic voters – in particular, racial minorities – tend to be geographically concentrated. In addition, because turnout in such populations is often lower, creating majority-minority districts to, say, protect a redistrict from challenge under the Voting Rights Act is generally thought to require creation of a supermajority, further packing Democratic voters. Cross posted at Shark and Shepherd. Previous Previous post: Empathy Anyone?